Catching Tadpoles | Editor's Note | Kids VT - small people, big ideas! There haven't been many sunny Saturdays this spring, but one at the end of April gave me a glimpse of summer. My partner, Ann-Elise, had helped organized a scavenger hunt at Gilbrook Pond in Winooski, and the kids and I participated. We were supposed to look for evidence of wildlife. My son Graham ran off with a friend, so my daughter Ivy and I searched on our own. We didn't see much until I noticed tadpoles swimming in the pond. They were some of the biggest I'd ever seen, with long, sleek tails, and round, half-dollar-sized bodies. There were some hiding in the weeds at the water's edge, so I crouched in the mud and tried to scoop one up with my hand. It took a few tries, but I finally caught one of the slippery suckers. Ivy's almost 3, and I don't think she'd ever seen a tadpole up close. When I opened my hand and showed it to her, she couldn't take her eyes off it. I explained that the tadpole was a baby frog, that it would soon grow legs and lose its tail. Then I turned it over in my hand and showed her the tiny legs visible beneath its translucent skin. I let her hold it, then we dropped it back into the water and watched it swim away. Once it was gone, Ivy said, "Let's catch another one!" We spent the next hour stalking tadpoles. She got pretty good at spotting them. When I think of summer, I imagine warm months filled with moments like this one, times when I can show my kids something new about their world. It's as fun for me as it is for them. 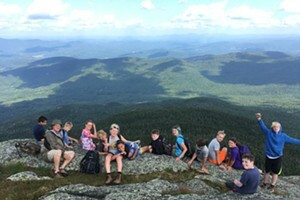 In every issue of Kids VT, we help connect Vermont parents with these experiences — through our daily events calendar, through the ads, and through activity suggestions in "Kids Beat" and "Fit Families." This month, we're also introducing a seasonal spotlight — a reminder to take advantage of something that only happens once a year. On page 25, we've compiled a list of places to pick strawberries. This issue also includes the first of our three-part series on Vermont "day-cations," day trips that we hope will help readers make the most of summer. Because, as we all know, it goes by fast. And it's not just the weather that will change. Those tadpoles will turn into frogs soon enough.